Democratic Sen. Chuck Schumer of New York is demanding climate concessions in any infrastructure package. Schumer sent a letter To President Donald Trump asking for green energy tax credits as part of the deal. Trump proposed more than $1 trillion in infrastructure spending earlier this year. 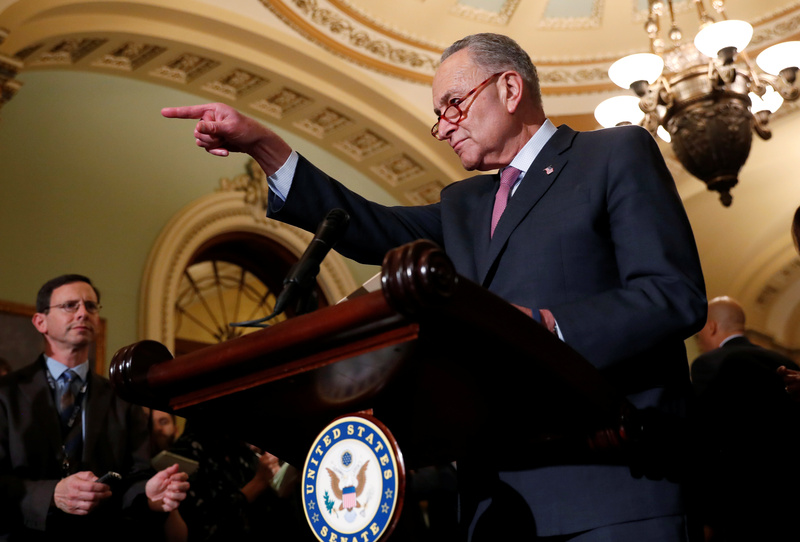 Senate Minority Leader Chuck Schumer told President Donald Trump that Democrats won’t cut a deal with him on infrastructure spending unless it includes a slew of policies aimed at fighting global warming. Schumer, the Senate’s top Democrat, called for, among other things, making green energy and electric vehicle tax credits permanent, more research funding into green technology and funding to harden infrastructure against extreme weather. “The impacts will continue to worsen if we do not take decisive and immediate action to transition to a 100-percent clean energy economy,” Schumer wrote in a letter to Trump sent Thursday. “A single infrastructure bill will not solve our climate problem in its entirety, but it is an important first step,” Schumer wrote to Trump, also giving a list of demands for any infrastructure plan. U.S. Senate Minority Leader Chuck Schumer addresses Capitol Hill reporters following the Senate Democratic weekly policy lunch at the U.S. Capitol in Washington, U.S., Nov. 27, 2018. REUTERS/Leah Millis. Schumer’s letter, and accompanying Washington Post op-ed, come as Democrats push for global warming to become a central focus of 2019. A small, but growing, cadre of Democrats led by Rep.-elect Alexandria Ocasio-Cortez of New York want “Green New Deal” legislation to rapidly force the U.S. to use 100 percent green energy. 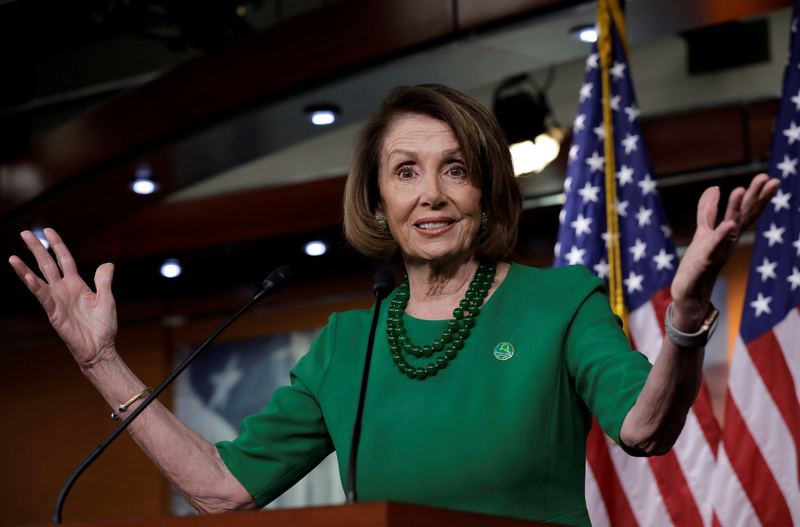 House Minority Leader Nancy Pelosi, who’s expected to be elected speaker next year, favors reviving a special committee on global warming, much like the one behind the failed effort to pass cap-and-trade legislation in 2010. Other top House Democrats, however, favor pushing climate bills through existing committees, fearing the creation of a special panel on the issue could unnecessarily delay legislation. U.S. House Democratic Leader Nancy Pelosi gestures during a news conference on Capitol Hill in Washington, U.S., Dec. 6, 2018. REUTERS/Yuri Gripas. However, Trump and Republican lawmakers are unlikely to support any infrastructure package that includes reversing tax cuts signed into law late in 2017, especially if that includes reversing corporate tax cuts the GOP has been fighting for years to lower. Likewise, many Republican lawmakers and conservative groups oppose making green energy tax credits permanent. And Trump recently criticized GM for cutting thousands of jobs to ramp up electric vehicle production. Many automakers, including GM and Tesla, expect to see electric car subsidies drop from $7,500 to $3,750 per vehicle by the middle of next year. Federal electric vehicle subsidies start to phase out for companies that produce 200,000 or more.